the 10" driver is actually a passive radiator, and there are two 6" mids i assume wired out of phase on a baffle in the center. Only high-level inputs obviously, but this confuses me. Is it intended to be wired in-line with R/L mains or wired on its own channels? It seems like a poor design internally, the polyfill had to be inhibiting the movement of the driver that sits below the PR. How much did this sub cost? i don't have the foggiest idea. manuf. date on the PR is '92. Wow. '92 is way old. My best guess is that this is a part of a sub/sat system such as the RM series. Seems like an odd configuration to me. Polk has a good "archive" page on their site which has info on lots of old speakers. I couldn't find a subwoofer, whether on its own or as part of a sub/sat system, with 2 6" drivers and a 10" passive radiator. That'd be a bandpass design. They are optimized to "boom" on a relatively narrow frequency range that corresponds to the resonance of the port or, in your case, the passive radiator. I see a few things there that may date back that far, but who knows. It is high quality, very solid build with butyl surrounds, etc...it probably wasn't cheap. I've tried it on a few receivers, and i KNOW nothing is blown, but i just can't get any appreciable output out of the thing. Maybe i'm just expecting too much. I was going to grab a 100w amp from PE to power it, but now i'm afraid i'll toast those mids if i put that much power into it. May very well be it was designed to be a more neutral, musical sub. It looks like a bandpass design, yes, but I've never seen a bandpass design with a passive radiator instead of a port; for that matter, I don't think I've ever seen a passive radiator as the only external driver on a speaker. If it's not getting loud at all, I wonder if maybe those 6" drivers aren't actually wired out of phase? It couldn't hurt to check. Maybe it got screwed up somewhere down the line. Or wait.... it's got inputs for both channels. Maybe one channel is sent to 1 driver, and the other to the other driver. Are you sure you don't have the polarity of one of the speaker wires accidentally reversed? Try disconnecting one channel, and see if things get louder. IMO, 100W is unlikely to damage 6" drivers. IME it's not wattage that does damage; it's being overdriven (clipping) which actually happens due to a lack of power, and stupidity on the part of the operator. Looks like a combination of a push-pull configuration in a bandpass enclosure. Here's some info on a push-pull setup. Two drivers share an acoustic volume of air within a single enclosure. The best way to take advantage of this alignment is to mount one driver facing outwards with the other driver inverted and facing inwards. The drivers are then wired so that they are electrically out of phase while remaining mechanically still in phase with one another. Odd ordered harmonics are cancelled out by using this approach according to Vance Dickason. According to M&K who specialize is push/pull subwoofers claim that this approach cancels out even ordered harmonics. So take your pick. Either way, harmonic distortion is reduced in that any anomalies or variations in the two driver's spider, cone or suspension characteristics are canceled out by the other driver's inversely proportional anomalies and variations. The sound is as accurate and pure as it can possibly be with each driver "correcting" the other driver. Of course many times two drivers will share the same acoustic volume of air while maintaining the more traditional look of having both drivers fire forward into the listening environment. Though this does not have the same harmonic cancellation effect, all other characteristics between the two alignments is identical. Box volume must be twice that of a single driver. This can be easily modeled by taking the Vas of a single driver and multiplying it by two. The system has an increased efficiency of 3dB over a single driver. Power handling for the system is twice that of single driver. Frequency response is the same for a single driver in an enclosure excaly half the size. Increased output and power handling. Very high SPL capability. One single huge speaker enclosure that may be both unattractive and hard to move. Response it essentially identical to building two smaller enclosures of exactly half the size but without the versatility of placement of two separate subs. If one of the drivers blows due to too much power, the whole speaker will no longer perform because the blown driver will begin to act like a poorly-tuned passive radiator. There are no real disadvantages to building this kind of enclosure as the speakers will behave just as they would in enclosures by themselves. 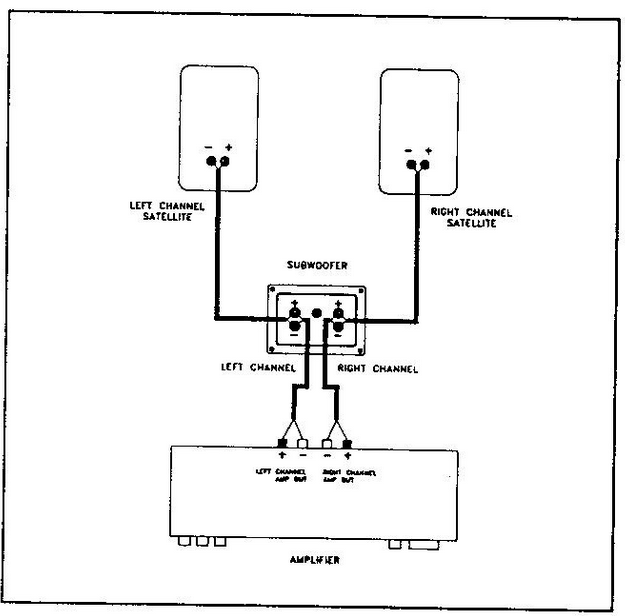 It's very common to make MMT style speakers and use the two drivers in the same enclosure. Where one sub just isn't enough. High power high output applications. If you choose to do the push/pull configuration, the sonic advantage may make this sub more suitable for audiophile music and critical listening experiences. So to the OP...how much you want for it plus shipping? oO For reals? PM me. 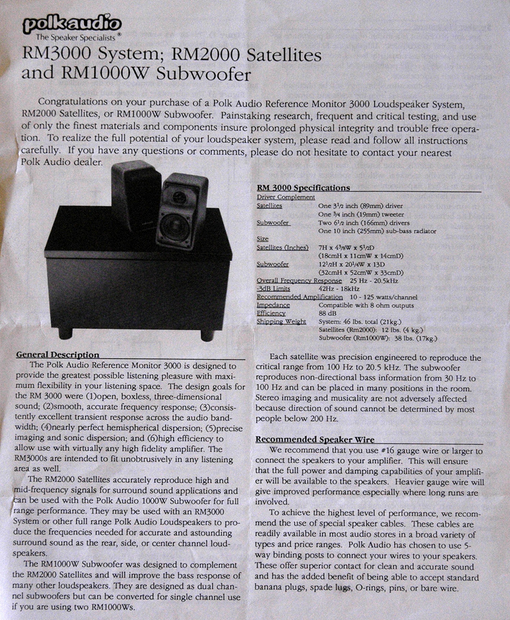 The passive subwoofer is model number RM 1000 W and the 2 satellites sold with it are RM 2000. Yes it is designed for accurate musical reproduction, think playing rock with tight, solid bass but not below 40hz. It was designed to run in series with the satellites using left and right channels - see pics below for what that means. Old thread but that diagram represents PARALLEL wiring not SERIES. Parallel is + to +, - to -. on both speakers. Series is - to + between the two speakers. The connection you show is parallel .